The CoffeeShop Blog: CoffeeShop Rounded Corners Free Action/Tutorial! CoffeeShop Rounded Corners Free Action/Tutorial! Here it is, the free CoffeeShop Rounded Corners Action/Tutorial for Photoshop and Photoshop Elements! This is actually pretty easy and I unfortunately I can't remember where I found it. Round corners on images that are already edited, flattened and cropped. This should be your final step! 1. Open image. Edit, flatten, and crop to desired size. 2. Select, All. Skip to step 4 if you have PSE. 3. Skip this step if you have PSE! PS7: Select, Transform Selection. On the top, W (width) enter 99.5%, H (height) enter 99.5%, press enter to transform. For some reason in PS7 (and perhaps newer versions of PS???) you can't do step 4 unless you move your selection in from the edges. 4. Select, Modify, Smooth. You can enter 1 - 100 in this box. If you have a higher resolution image such as 300 dpi, enter 100 and press enter. If you have a lower resolution image such as 72 dpi, you might want to start with 25-50. 5. Look at your edges and see if they are rounded enough. If not, please repeat step 4 until your corners look nicely rounded. Once you have done this a few times you will know what numbers to enter to get your desired look. For my 4 x 6 inch, 300 dpi images I usually enter 100 two to three times. 6. Ctrl-J (copy your background to a new layer). 7. Throw away your background. 8. Admire your rounded corners image! If you want to add a colored fine edge, just go to Edit, Stroke, and select your color and pixel size (I usually use 2 - 5 px) and press enter. 9. If you are displaying this on a white background, just go ahead and save it as a .jpg and you are done. If you need to display this on another color background (such as black), please go to step 10. You can also save your rounded image as a .psd file at this step and change the color for the background as needed. 10. Save as a .png. This will keep the corners translucent. If you would rather use my action and save some time, please download it from the link below. This action works on PSE5 and PSE6 on Vista, and PSE6 on XP. Please note that this action performs the Modify, Smooth edges 3 times automatically, so if your edges look appropriately rounded by the first or second time, then enter 1 when it prompts you the additional times. If you want to add a fine outline to your edges after the action runs, follow the directions in Step 8 of my tutorial. This action should be run on a photo that will be placed on a white page, so if you plan on placing this image on a page that is a different color (say a blog with black pages), please follow Step 10 and 11 in the tutorial after running the action. 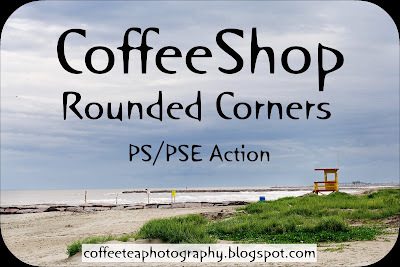 Download the CoffeeShop Rounded Corners Action HERE! If that link does not work, then click HERE. Thanks again for another time-saver!!! Thanks again for sharing another one of your fantastic actions! Thank you so much for this tutorial! Just this morning I was trying to do this and the rounded corner cookie cutter tool in PSE6 wasn't giving me the results I wanted. I went back and tried your method and it looks awesome! Thank you. thanks...can't wait to try this out!! Thanks, can't wait to try it out! Your actions are fabulous! Thanks so much for sharing an action for PSE! Thank you SO much for posting the rounded corner action! I have been searching for an easy way to round the corners of the images of my blog. Your action has saved me an incredible amount of time. Thank you so much for providing it for free! I'll definitely be back on your site often! This is fabulous..I learn something new everyday..So simple and so easy..Thanks a ton again! THANK YOU THANK YOU THANK YOU! This saves SOOOOO MUCH time and money for all of us! you rock! Just downloaded and tried the action. Thanks so much! wow- thank you so much for providing the free download to this action! i love it! Thanks so much for your great actions! They are really sparking up my pages!!! anybody else not being able to download?? Thanks! I love this! It's so easy. I have a problem with both flickr and blogger though. Even though I saved my rounded picture as a PNG, flicker adds a square corner and blogger puts a grey square corner. Any thoughts? Thank you!!! Your tutorials so easy to follow, as usual !!! thank you for the action! I have a question though, after I round the corners i still have the background making up the rest of the pic. how do i fix this? A big thank you for the tutorial and action... much appreciated! Ia there any way to auto-set the sample radius, because when I run it batch I would have to sit at the computer the entire time to press ok or correct the sample radius for every image. If you have Photoshop you can go and edit the action!